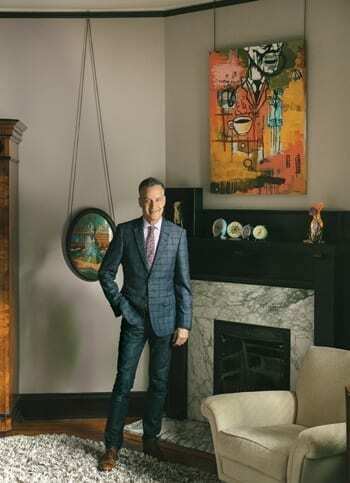 Art and antiques lover Mark Edge thoughtfully revived his historic Midtown home and filled it with one-of-a-kind treasures. 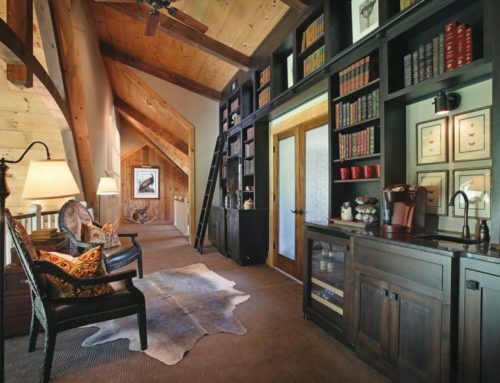 Here, he shares lessons learned and why this 10-room home means so much to him. Homeowner Mark Edge loves collecting clocks, artwork and much more. “My motto is that if you love a piece of art and you can afford it, buy it,” he says. 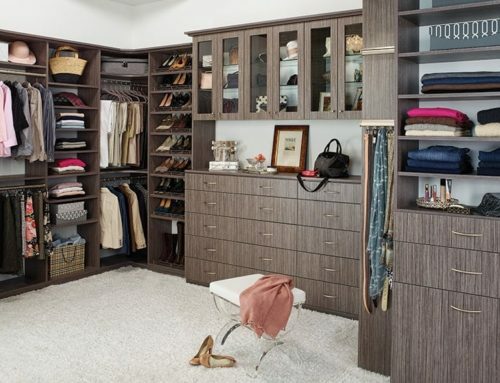 There are before-and-afters when it comes to home improvement, and then there are Before-And-Afters. Celebrity jewelry designer Mark Edge’s Midtown residence is most certainly the latter. Just as he carefully crafts each wearable piece of art for his 24-year-old company, Mark Edge Jewelry, he also wisely chooses each eclectic item in his home. 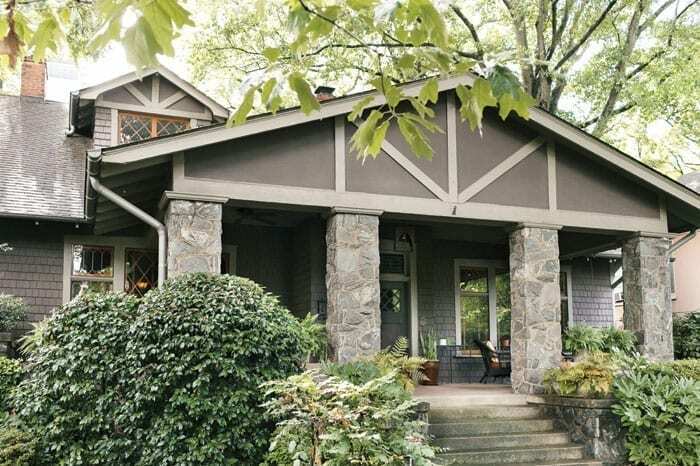 Situated less than two blocks from Piedmont Park, this 100-year-old home had all the makings of a teardown—awful remnants (visual and aromatic) of sitting vacant for more than three years, dust and damage from coal-burning fireplaces and a look of decay and dilapidation that only occurs when a home has truly been neglected. But there was also something else: hope. Restoring Edge’s 4,400-square-foot home, originally built in 1909 by Georgia governor William J. Northen, certainly was an endeavor of titanic proportions. Northen and his family, who were mostly lawyers and mortgage bankers, lived in the home for about 100 years (grandson George T. Northen was a notable socialite and involved in many philanthropic organizations throughout the country). Exterior view of Edge’s beautifully restored home, which took two years to complete. 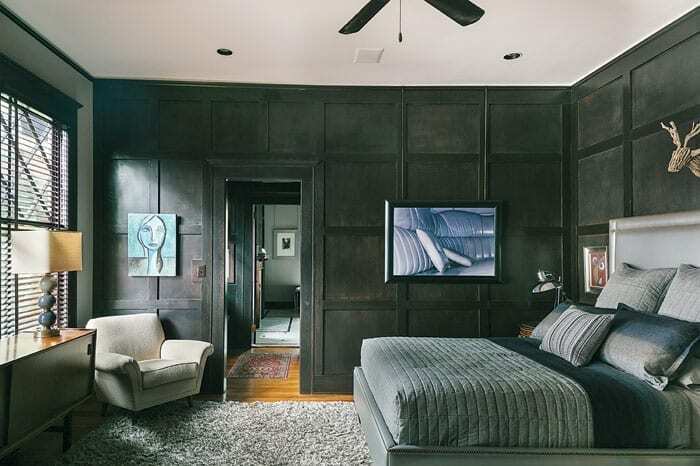 Wikman added the master bedroom’s floor-to-ceiling stained wood paneling alongside the original painted plaster walls to create a bold space, ensconced in lush fabrics, shapes and images. The bed was another custom piece, created by Wikman’s furniture company, Bjork Studio. Wikman and Edge salvaged and restored elements in creative ways, like recycling the home’s main kitchen into the property’s one-bedroom, detached guest/carriage house, and keeping existing radiators for purely aesthetic purposes. Every square inch was touched (perhaps in this case, retouched), which is part of the fun when exploring Edge’s fabulous, art-filled bungalow—the library’s bronze doorknobs from New Orleans and painstakingly preserved pocket doors, the 1970s conference-table-turned-dining-room table (rumored to have sat in Ted Turner’s conference rooms at his billboard business Turner Outdoor Advertising), an original service button hidden under a chic floor rug, and much more. Testing the limits of restoration and great design is all on the table, or in this case, custom elliptical island. 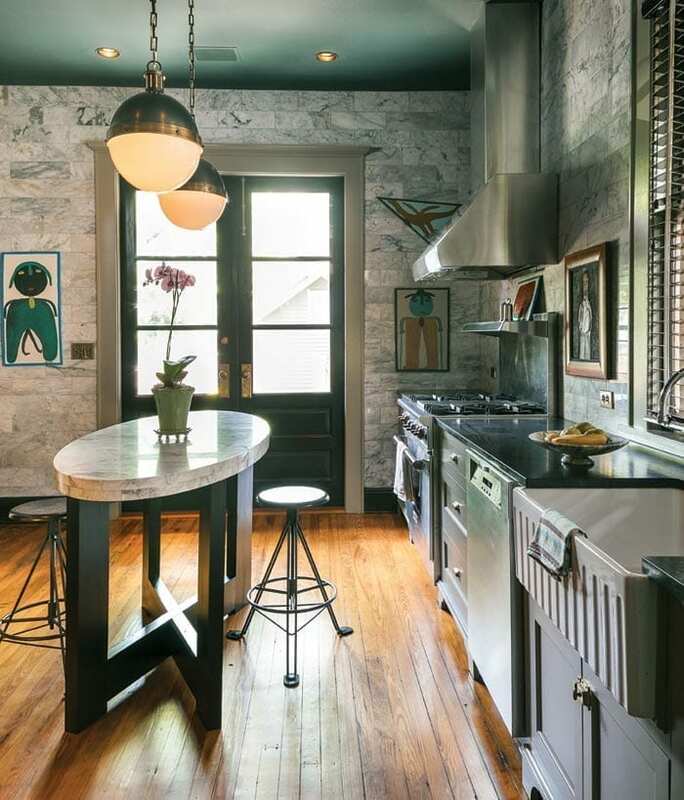 The kitchen’s floor-to-ceiling, brick-patterned marble tiles, which have an exquisite, veined effect with grays and blues, balance the unexpected teal-hued ceiling. 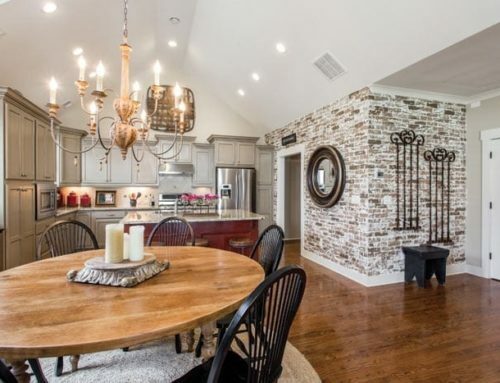 Other standouts include the farmhouse sink, Sub-Zero glass-front refrigerator and range, and the stunning eight-foot French doors that open to the terrace. Undertaking a project like this came with lots of growing pains for Edge. His major takeaways? “Take advantage of the historic rehabilitation tax credit from the Department of the Interior, freeze property taxes at your purchase price for eight and a half years, have a lot of patience and a master plan and budget in place before you start a project.” Set a realistic time frame for completion date and other pertinent components. 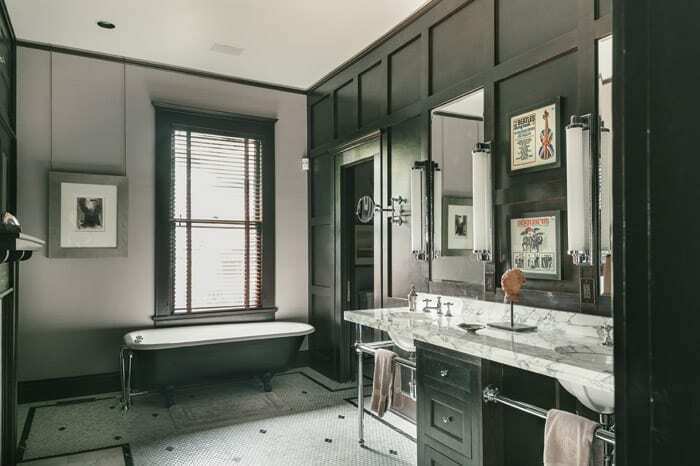 “Restorations take a lot longer and cost a lot more than you can imagine.” He also says to be sure to work with an architect and interior designer who understand the restoration process as well as what’s appropriate for the structure. Over the course of nearly two years, Edge and Wikman salvaged as much as they could; not only paying homage to this historic home, but also creating the perfect setting to show off Edge’s collection of stunning art, eclectic antiques, and unusual knickknacks. 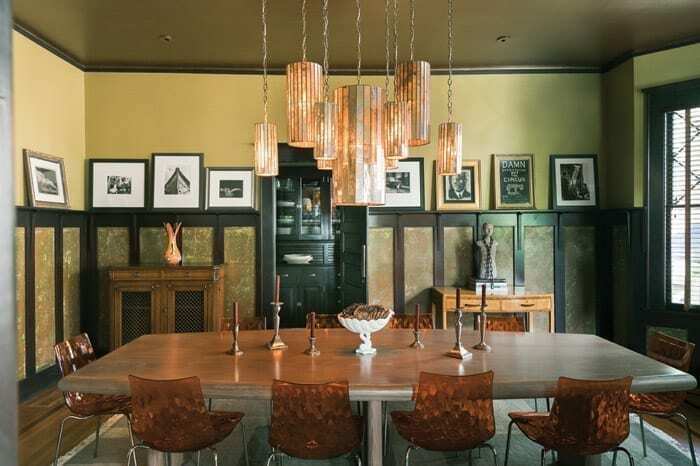 The dining room’s warm color combinations of olive/chartreuse, burnt orange and soft metallic cleverly accentuate both the original architecture and Edge’s art collection. Even the light fixture is, by extension, a work of art itself—Wikman had the individual mirrored pendants, from Notre Monde, mounted to create one, dramatic piece. The lighting successfully highlights the Italian acrylic chairs and the large table, rumored to have once been a conference table that Ted Turner pulled a chair up to. “We didn’t change the footprint of the house at all,” says Wikman. 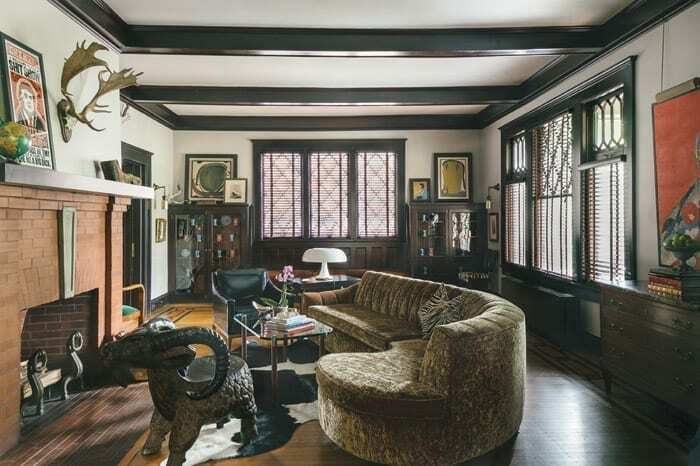 The restored, original brick fireplace in the living room greets visitors, as they pass along the original hardwood flooring inlays, by the leaded glass bookcases and bench seating. And this piece of wood, which resembles a foot, sitting atop the mantel was in the fireplace when Edge first acquired the home. It has now been promoted into his beloved collection of art. Edge is obsessed with art. His curatorial ability to pull pieces together is a skill that intrinsically works in the house’s eclectic style. “He sees the beauty in the unusual,” says Wikman. 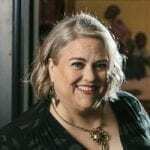 • A seasoned interior designer and co-owner of Bjork Studio, her Westside atelier offers new, vintage and custom furniture for residential, commercial, and hospitality spaces. 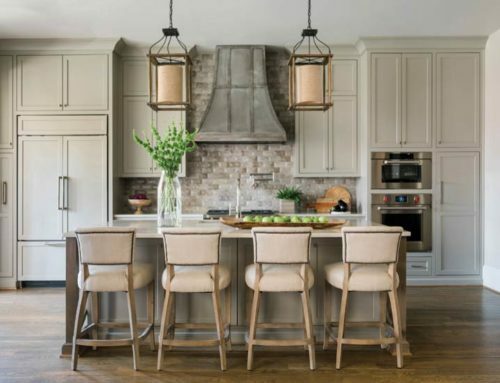 • With an eye for detail, Wikman and team are committed to doing things “the old-fashioned way.” They create and manufacture fine furniture and impeccably-crafted upholstery, which includes their own signature line of furnishings.